Published May 20, 2011 at 640 × 480 in Coleman Watching Tap. 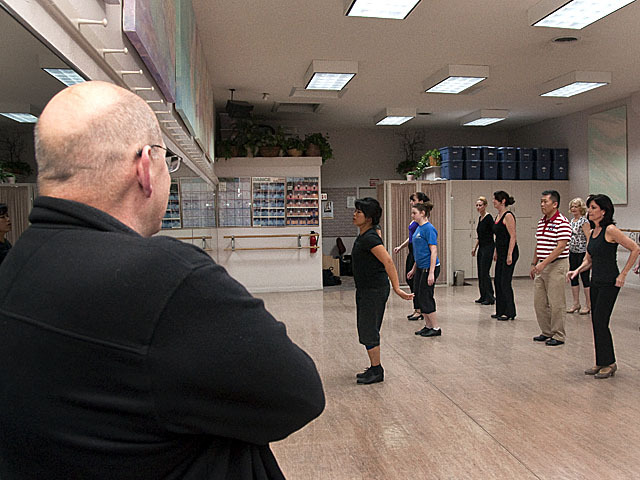 Direc­tor Jim Cole­man watches chore­o­g­ra­pher Eve­lyn Bar­ney put her stu­dents through their paces at the first “tap dance school les­son” for 42ND STREET. Know­ing that he would have a dif­fi­cult time find­ing tap­pers in California’s Cen­tral Val­ley, Cole­man arranged for the “school” for prospec­tive cast mem­bers. The classes con­tin­ued for six weeks before the show’s auditions.